The first thing that you have to understand about gasoline powered electrical generators is that they are not a long-term power source. They are useful during power outages, but even the most efficient units use a lot of gasoline if you keep them running full time. Even during power outages it is wise to use the generator only when necessary. Since I have kerosene lamps, a wood heater, and a propane cook stove; I only really need to run my generator a few hours a day to keep the refrigerator and freezer cold and to pump water for a bath and to flush the toilets. While the generator is running anyway, I take the opportunity to recharge my flashlights, my radio, my wife’s cell phone, and her laptop. These items draw very little wattage. I have had a generator for several years. I did a lot of research and a lot of comparing before I bought my generator. I ended up getting a Black Max Generator from Sam’s Club. It has a surge rating of 6560 watts and regular operating rating of 5250 watts (more about this below). I wanted a generator that had enough power to run my home, but I didn’t want one that would be overpowered and eat up a bunch of gasoline. I also wanted a reliable unit, and the Subaru motor on this generator has worked without fail so far. Pictured Below: My generator ready to be plugged into the house. One thing that has always been a pain about operating my generator is stringing out extension cords and plugging and unplugging various appliances. I recently had a plug and switch installed on my house so that I can plug the generator into the end of the house and throw the switch which disconnects me from the grid and switches over to generator power. The switch keeps the generator produced electricity from backfeeding into the power lines and electrocuting some innocent lineman who is working on reconnecting the power lines. 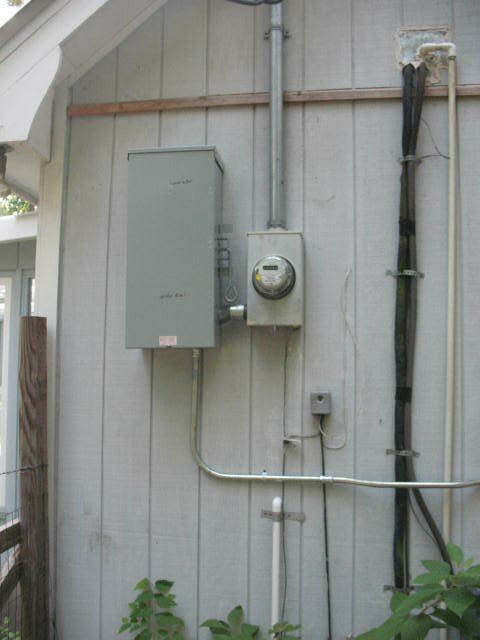 Pictured Below: The big gray box to the left of the meter box is the switch that disconnects me from the grid and connects me to the generator. Before I plug in the generator I turn off all the breakers in my breaker box and then, after the generator is running, I turn on selected breakers for the circuits that I want to operate. Lights and ceiling fans draw little wattage. The refrigerator and freezer draw significant wattage, but they only need to run for two or three hours a day to keep everything cool. It’s simply a matter of running them during the day when the lights are off. The one-horse 220v. well pump draws a lot of wattage when the motor kicks on, so I try to have the refrigerator and freezer off when the pump is running. Central air conditioning, electric heat, and an electric cook stove are out. They draw far too much energy to be powered by a generator. I do have a small window unit air-conditioner that I can use to keep one room cool in really hot weather. In general, anything that produces heat or has a good-sized motor will draw a lot of wattage. 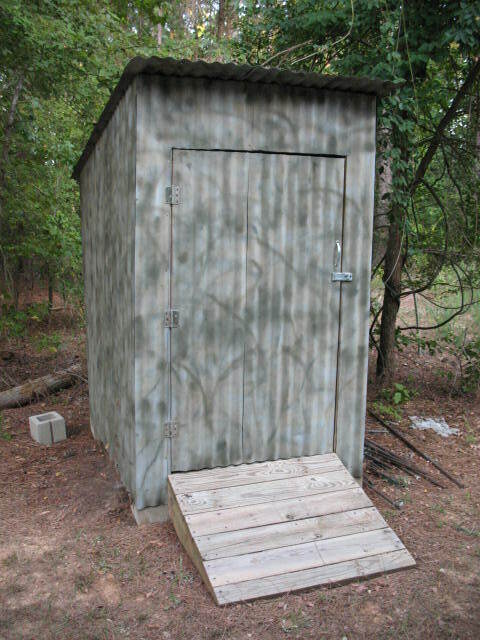 Pictured Below: Small storage building where I keep my generator and a can of fuel. If you are considering purchasing a generator, you are probably as confused as I was about what size you need. After all, these things run on gasoline or propane, and the bigger the generator, the more fuel you will use. You don’t want to burn fuel to produce more energy than you will need, but at the same time you want to be sure that you have enough power to run the things that you need. Let me try and save you some headaches by telling you how I finally arrived at a formula for picking the right size generator. The first thing that you need to know is that generators have two ratings. One is the regular operating wattage, and one is called the surge wattage. You see, some appliances, like a light bulb, use the same amount of watts at all times, while other appliances, like a well pump, take a lot of watts to get started but less watts to keep running once they are in operation. These extra watts to get an appliance going are where the surge rating comes in. Your generator’s surge rating tells you how many watts the generator will provide for a short time, but this is not the wattage at which the generator was designed to produce power for an extended period of time. To figure out how much generator you will need, you must add up the total wattage, including surge wattage, of all the appliances that you plan to run at one time. Your generator needs to have a surge wattage rating equal to at least this amount. Now add up the operating wattage of all the appliances that you plan to run at one time. Your generator needs to have an operating wattage equal to two times this number. The reason for this is because your generator will work most efficiently if you only draw on half of the rated operating wattage. More than this will put undue strain on the generator. If you try to run all of your appliances at one time you will need a huge generator; and you will, consequently, burn a huge amount of fuel. It is much more efficient to use your breaker box to control which circuits you will have on at any one time. I have each breaker in my breaker box marked with the amount of watts that are drawn by the appliances on that circuit (this is somewhat inexact because you may not have all the appliances on a particular circuit turned on, but it gives you a guideline). I have a card tacked up over the breaker box that shows the operating wattage and surge wattage of my generator. When I get ready to turn several circuits on, it’s a matter of simple addition. The total wattage of all the circuits operating at one time must have a surge rating of less than the surge rating of the generator and an operating wattage of one-half of the operating wattage of the generator. If I am about to throw a breaker that will exceed either of these numbers, then I know that I’m going to have to turn something else off first. 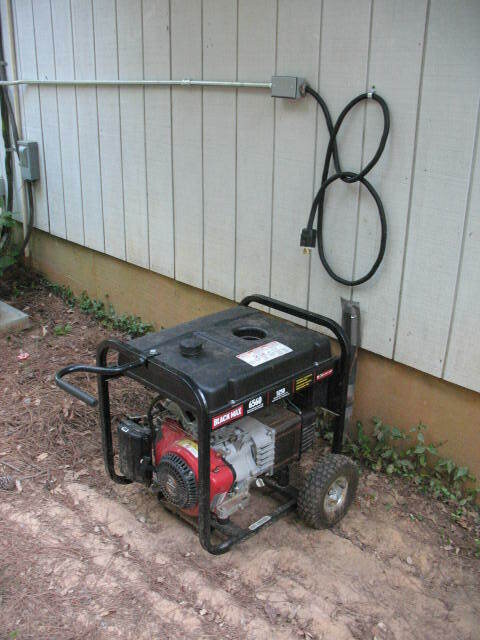 Of course it doesn’t do any good to have a generator if you don’t have any fuel for it, so keep some gas on hand (stored well away from your home, of course). I keep about 25 or 30 gallons in five gallon containers. About every 2 or 3 months I pour this gas into my truck and go refill the gas cans. This way I always have fresh gas. I keep a few bottles of fuel stabilizer on hand but it is too expensive to use if you don’t have too.